The 2013 Paradise Palms DOCO MOMO Open House Day is coming up on October 5th, 2013. Five private mid-mod homes will open their doors for the tour plus several for-sale homes will be open as well. Registration for the tour starts at 11:45 in the lobby of the Las Vegas National Golf Club (1911 East Desert Inn Road) and runs until 4:00. The first house opens at Noon. Tickets are just $5 per person, no RSVP needed. 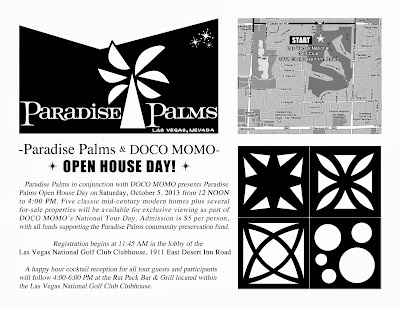 Don’t forget to join us for a Paradise Palms cocktail party 4:00 – 6:00 PM at the Rat Pack Bar and Grill at the Las Vegas National Golf Club Clubhouse. Drink specials will be offered for all tour participants! We look forward to seeing all our friends and fans on this special mid-mod tour day.